Certified divers listen to PADI Divemaster intern Majda briefing the dive site! 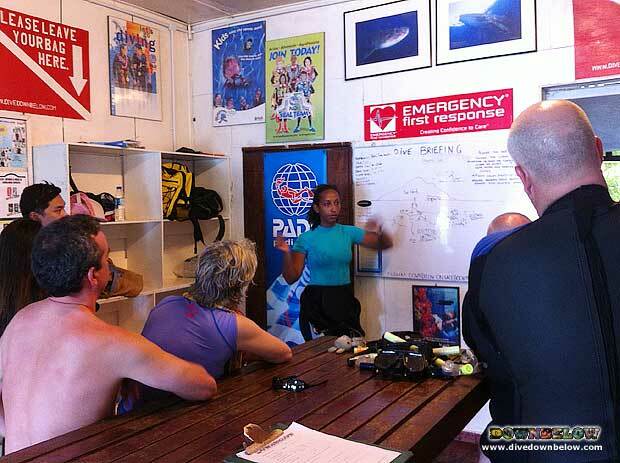 Home/News/Certified divers listen to PADI Divemaster intern Majda briefing the dive site! Majda, our PADI Divemaster intern, has worked so hard on her Go PRO internship program and even though she’s not a PRO just yet, she’s delivering dive site briefings just like a PRO! Our certified divers listen very carefully to our confident PADI Divemaster candidate as she reminds them on our procedures. Of course, she mentions divers’ favourite part of a dive briefing – what marine life is typical at the dive site! Majda doesn’t show any anxiety as her mentor and PADI IDC Staff Instructor Tim, assesses her dive site briefing. During the open water dives, Majda will guide one or two of the divers, whilst Tim provides direct supervision. Majda has experienced so much real diving situations as part of her internship program, not only the PADI Divemaster course training. All our internship candidates are encouraged to observe the operations of our premier PADI 5 Star IDC Dive Centre to fully appreciate the Go PRO dive lifestyle. Whether you are a recreational diver or already a season dive educator, one of our friendly and helpful staff in our Head Office at KK Times Square will organise a program to address your Go PRO needs! By Joanne Swann|2014-02-28T16:25:07+08:00March 1st, 2014|News|Comments Off on Certified divers listen to PADI Divemaster intern Majda briefing the dive site!